Actually we were supposed to climb Gunung Benom but our guide Lim from Kuantan (Cemerong and Gunung Berumbun guide) informed us that Gunung Benom trail has a small campsite and seeing our large group of more that 30 members making it difficult to accommodate. 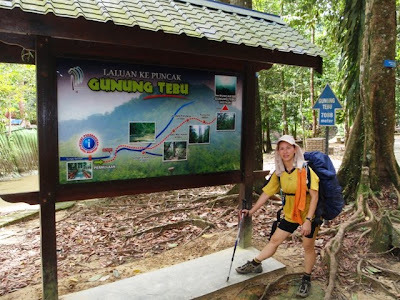 While we thought about it, Lim suggested Gunung Tebu. Gunung Tebu or literally translated as sugarcane mountain is located in the Besut District. This mountain on a clear day can view the South China Sea together with the famous Pulau Redang, Pulau Lang Tengah, Pulau Perhentian Besar and Kecil. Furthermor e this mountain has many legends and mysticism surrounding it. Some people would spend months up here in solitude and meditation. You can find graves up there and there's one near the campsite overlooking the South China Sea. This grave, I was told belonged to Tuan Haji Tok Singh which cannot be confirm. There are many various wildlife, herbs and bonsai trees found here. During the monsoon season the winds and storms are fierce so make sure your tents are well peg down. The road distance from Kuala Lumpur is approximately 530 km passing through Bentong, Raub, Kuala Lipis, Gua Musang, Jertih and finally Besut. 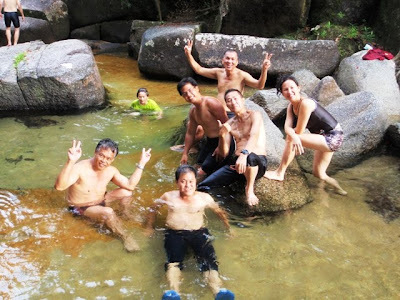 Our usual team member Michael Lim could not make it and instead a new member Sabryna Lim (nature tourist guide from Kuala Tahan, Taman Negara) join us (includingWong, KC and myself). We had a smooth troubled free drive especially using a GPS which guided us here. We left Kuala Lumpur around 7.00pm and arrived at Hutan Lipur Lata Belatan at about 2.30pm driving at a leisure pace including stops for breakfast, tea breaks and finally lunch at Jertih town. Breakfast near the morning market in Bentong is the popular 'wan tan mee' or you can buy the many local snacks around the market. Traffic was relatively low and probably due to the fasting month for muslims. It is interesting to note that to arrive at our destination we cover 4 states (Selangor, Pahang, Kelantan and Terengganu). Lata Belatan Recreation Park has good facilities from campsites to toilets with water supply. It has a wide waterfall area surrounded by park benches and gazebos. From Hutan Lipur Lata Belatan where the trail head starts it takes about 3 to 4 hours with backpack to the peak. 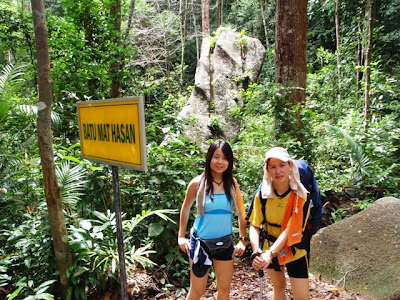 For those who prefer to camp at Hutan Lipur Lata Belatan can hike up to the peak probably less than 3 hours without backpacks. This time estimation are for those who trek regularly. Especially after the long drive it is better to camp at Lata Belatan Recreation Park. We were first to arrive and chose a nice cozy spot (gazebo with opposite bench) at the highest point near the waterfall to camp for the night. Since it was early we laze around at the waterfall while waiting for the others to arrive. As night fall KC started preparing dinner. Dinner consisted of salted chicken (pre-pack by Wong's wife), chicken and vegetable soup with rice. 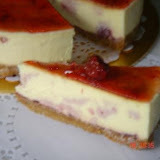 Delicious mmm! We slept early around 9.30pm. Since the 2 benches (opposite sides) were taken up by Sabryna and Wong, we had to pitch our tent in the middle. At around midnight there was heavy thunderstorm and strong winds and everyone woke up, rainwater started coming in. With quick thinking we started tying our floor sheets around the gazebo like a hut to keep us dry. We woke up around 7.30 am thinking that it was still dark, actually it was dark because of the floor sheet covering our sleeping area. We had noodles with soup and tea. Packing quickly and started the trek at around 8.30am, Lim (our guide) had arrived one day earlier and camp at the peak, he was very helpful by laying a paper trail guiding us to the top. The trail is also well marked with fairly flat terrain and after a river crossing the trail has moderate gradient. In the earlier part of the trail there are many campsites by the river for small groups. After trekking for 2 hours we arrived at Batu Mat Hassan for a short break and for some snacks. From here onwards the gradient becomes steeper a short while you will reach another stop call Jendela Pandang or view point. And another 10 mins to another stop where water source is about 120m downwards for crystal clear drinking water. This point onwards another 2km to the peak. 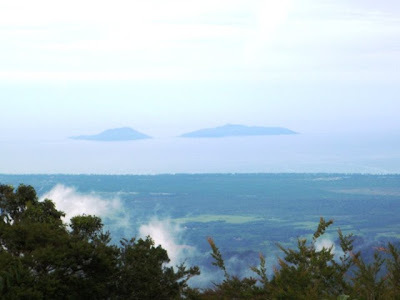 Usually campers don't camp at this peak and instead take a left trail down towards a bigger campsite and it is here you can view the South China Sea and the islands. There is a water source towards the right and about 15 mins. Upon arriving in the afternoon it is hot so we found a nice little spot near to the rocks for some shelter. A better choice would be relax at Lata Belatan and start trekking after lunch so that you arrive at this campsite around 5 where it is cooler. The previous night Lim (Kuantan) and his friends that camped here had a nasty experience as it rain heavily with very strong winds and one of their tents which was not peg down was blown away. Luckily they managed to retrieve it back. As I reach this campsite I met 2 gentlemen and their told me they had been here since the start of the Puasa month and will only return to Kuala Terengganu on Hari Raya. One of them Mohd Shuib was very kind to peg down all our tents by cutting branches into pegs for our tents and warn us about the strong winds. Dinner for tonight was special rice soup with vegetables and dry shrimps that was eaten commonly during the post War World II. Since rice, meat and vegetables were scarce so most people ate sparingly whatever that can be saved. People back then were lean with not much fat unlike today where the obesity level has reached alarming stage. Immediately after dinner, KC started preparing for supper (talk about exercising to slim down) ginger and tapioca sweet dessert which was served piping hot and under the clear night and a slight cool breeze really sums up what camping is about. After that we just laze around on the big boulder and chat away till our eyes became heavy to call it a night. From a distance you could see flashes and the sound of thunder but luckily no rain for us. Morning rise and shine, a simple breakfast of hot tea and biscuits. After that everyone started packing and getting ready to leave. Well any extra food was left behind for the two gentlemen. The trek down was fairly fast and we reach the Lata Belatan park within 3 hours. Took a nice cool bath and change to a fresh set of clothes. And back to Jertih for a delicious lunch. As it was still earlier we decided to detour to Gua Ikan and Jelawang Waterfall (Stong Waterfall). Dinner in Kampung Sempalit, Raub and back home. What a long drive but another great camping holiday and very economical. With food, accommodation, toll and fuel works out to about $120 per person.